Nasiri, M., Abdollahi, M., Rahbari, A., Salmanzadeh, N., Salesi, S. (2018). Minimizing the energy consumption and the total weighted tardiness for the flexible flowshop using NSGA-II and NRGA. 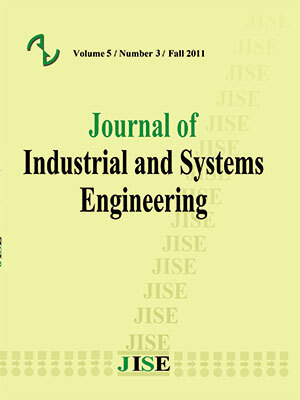 Journal of Industrial and Systems Engineering, 11(Special issue: 14th International Industrial Engineering Conference), 150-162. Mohammad Mahdi Nasiri; Mojtaba Abdollahi; Ali Rahbari; Navid Salmanzadeh; Sadegh Salesi. "Minimizing the energy consumption and the total weighted tardiness for the flexible flowshop using NSGA-II and NRGA". Journal of Industrial and Systems Engineering, 11, Special issue: 14th International Industrial Engineering Conference, 2018, 150-162. Nasiri, M., Abdollahi, M., Rahbari, A., Salmanzadeh, N., Salesi, S. (2018). 'Minimizing the energy consumption and the total weighted tardiness for the flexible flowshop using NSGA-II and NRGA', Journal of Industrial and Systems Engineering, 11(Special issue: 14th International Industrial Engineering Conference), pp. 150-162. Nasiri, M., Abdollahi, M., Rahbari, A., Salmanzadeh, N., Salesi, S. Minimizing the energy consumption and the total weighted tardiness for the flexible flowshop using NSGA-II and NRGA. Journal of Industrial and Systems Engineering, 2018; 11(Special issue: 14th International Industrial Engineering Conference): 150-162. This paper presents a bi-objective MIP model for the flexible flow shop scheduling problem (FFSP) in which the total weighted tardiness and the energy consumption are minimized simultaneously. In addition to considering unrelated machines at each stage, the set-up times are supposed to be sequence- and machine-dependent, and it is assumed that jobs have different release times. Two Taguchi-based-tuned algorithms: (i) non-dominated sorting genetic algorithm II (NSGA-II), and (ii) non-dominated ranked genetic algorithm (NRGA) are applied to solve themodel. Six numerical examples with different sizes (small, medium, and large) are used to demonstrate the applicability and to exhibit the efficacy of the algorithms. The results show that the NRGA outperforms significantly the NSGA-II in the performance metrics for all six numerical examples. Asif, M., & Muneer, T. (2007). Energy supply, its demand and security issues for developed and emerging economies. Renewable and Sustainable Energy Reviews, 11(7), 1388-1413. Choi, S. W., Kim*, Y. D., & Lee, G. C. (2005). Minimizing total tardiness of orders with reentrant lots in a hybrid flowshop. International Journal of Production Research, 43(11), 2149-2167. Dahmus, J. B., & Gutowski, T. G. (2004, January). An environmental analysis of machining. In ASME 2004 international mechanical engineering congress and exposition(pp. 643-652). American Society of Mechanical Engineers. Dai, M., Tang, D., Giret, A., Salido, M. A., & Li, W. D. (2013). Energy-efficient scheduling for a flexible flow shop using an improved genetic-simulated annealing algorithm. Robotics and Computer-Integrated Manufacturing, 29(5), 418-429. Davoudpour, H., & Ashrafi, M. (2009). Solving multi-objective SDST flexible flow shop using GRASP algorithm. The International Journal of Advanced Manufacturing Technology, 44(7-8), 737-747. Drake, R., Yildirim, M. B., Twomey, J. M., Whitman, L. E., Ahmad, J. S., & Lodhia, P. (2006). Data collection framework on energy consumption in manufacturing. Ebrahimi, M., Ghomi, S. F., & Karimi, B. (2014). Hybrid flow shop scheduling with sequence dependent family setup time and uncertain due dates. Applied Mathematical Modelling, 38(9-10), 2490-2504. Fang, K., Uhan, N., Zhao, F., & Sutherland, J. W. (2011). A new approach to scheduling in manufacturing for power consumption and carbon footprint reduction. Journal of Manufacturing Systems, 30(4), 234-240. Gupta, J. N., Krüger, K., Lauff, V., Werner, F., & Sotskov, Y. N. (2002). Heuristics for hybrid flow shops with controllable processing times and assignable due dates. Computers & Operations Research, 29(10), 1417-1439. Gutowski, T., Murphy, C., Allen, D., Bauer, D., Bras, B., Piwonka, T., ... & Wolff, E. (2005). Environmentally benign manufacturing: observations from Japan, Europe and the United States. Journal of Cleaner Production, 13(1), 1-17. JADAAN, O. A., RAJAMANI, L., & Rao, C. R. (2009). NON-DOMINATED RANKED GENETIC ALGORITHM FOR SOLVING CONSTRAINED MULTI-OBJECTIVE OPTIMIZATION PROBLEMS. Journal of Theoretical & Applied Information Technology, 5(5). Jun, S., & Park, J. (2015). A hybrid genetic algorithm for the hybrid flow shop scheduling problem with nighttime work and simultaneous work constraints: A case study from the transformer industry. Expert Systems with Applications, 42(15-16), 6196-6204. Lee, G. C., & Kim*, Y. D. (2004). A branch-and-bound algorithm for a two-stage hybrid flowshop scheduling problem minimizing total tardiness. International Journal of Production Research, 42(22), 4731-4743. Lee, G. C., Kim, Y. D., & Choi, S. W. (2004). Bottleneck-focused scheduling for a hybrid flowshop. International Journal of Production Research, 42(1), 165-181. Li, D., Meng, X., Liang, Q., & Zhao, J. (2015). A heuristic-search genetic algorithm for multi-stage hybrid flow shop scheduling with single processing machines and batch processing machines. Journal of Intelligent Manufacturing, 26(5), 873-890. Liang, P., Yang, H. D., Liu, G. S., & Guo, J. H. (2015). An ant optimization model for unrelated parallel machine scheduling with energy consumption and total tardiness. Mathematical Problems in Engineering, 2015. LIN, Z. Y., & Zhang, W. (2014). Study on Multi-Objective Optimization of Hybrid Flow Shop Scheduling Problem. Advanced Materials Research, 1082. Liu, Y., Dong, H., Lohse, N., & Petrovic, S. (2015). Reducing environmental impact of production during a rolling blackout policy–a multi-objective schedule optimisation approach. Journal of Cleaner Production, 102, 418-427. Liu, Y., Dong, H., Lohse, N., Petrovic, S., & Gindy, N. (2014). An investigation into minimising total energy consumption and total weighted tardiness in job shops. Journal of Cleaner Production, 65, 87-96. Luo, H., Du, B., Huang, G. Q., Chen, H., & Li, X. (2013). Hybrid flow shop scheduling considering machine electricity consumption cost. International Journal of Production Economics, 146(2), 423-439. Naderi, B., Zandieh, M., & Roshanaei, V. (2009). Scheduling hybrid flowshops with sequence dependent setup times to minimize makespan and maximum tardiness. The International Journal of Advanced Manufacturing Technology, 41(11-12), 1186-1198. Pechmann, A., & Schöler, I. (2011). Optimizing energy costs by intelligent production scheduling. In Glocalized Solutions for Sustainability in Manufacturing (pp. 293-298). Springer, Berlin, Heidelberg. Pinedo, M., Zacharias, C., & Zhu, N. (2015). Scheduling in the service industries: An overview. Journal of Systems Science and Systems Engineering, 24(1), 1-48. Rashidi, E., Jahandar, M., & Zandieh, M. (2010). An improved hybrid multi-objective parallel genetic algorithm for hybrid flow shop scheduling with unrelated parallel machines. The International Journal of Advanced Manufacturing Technology, 49(9-12), 1129-1139. Ruiz, R., & Vázquez-Rodríguez, J. A. (2010). The hybrid flow shop scheduling problem. European journal of operational research, 205(1), 1-18. Song, W., Zhang, C., Lin, W., & Shao, X. (2014). Flexible job-shop scheduling problem with maintenance activities considering energy consumption. Applied Mechanics & Materials, (521). Tang, D., Dai, M., Salido, M. A., & Giret, A. (2016). Energy-efficient dynamic scheduling for a flexible flow shop using an improved particle swarm optimization. Computers in Industry, 81, 82-95. Tavakkoli-Moghaddam, R., Javadian, N., Khorrami, A., & Gholipour-Kanani, Y. (2010). Design of a scatter search method for a novel multi-criteria group scheduling problem in a cellular manufacturing system. Expert Systems with Applications, 37(3), 2661-2669. Yan, J., Li, L., Zhao, F., Zhang, F., & Zhao, Q. (2016). A multi-level optimization approach for energy-efficient flexible flow shop scheduling. Journal of Cleaner Production, 137, 1543-1552. Yan, J. H., Zhang, F. Y., Li, X., Wang, Z. M., & Wang, W. (2014). Modeling and Multiobjective Optimization for Energy-Aware Hybrid Flow Shop Scheduling. In Proceedings of 2013 4th International Asia Conference on Industrial Engineering and Management Innovation (IEMI2013) (pp. 741-751). Springer, Berlin, Heidelberg. Zitzler, E., & Thiele, L. (1998, September). Multiobjective optimization using evolutionary algorithms—a comparative case study. In International conference on parallel problem solving from nature (pp. 292-301). Springer, Berlin, Heidelberg.